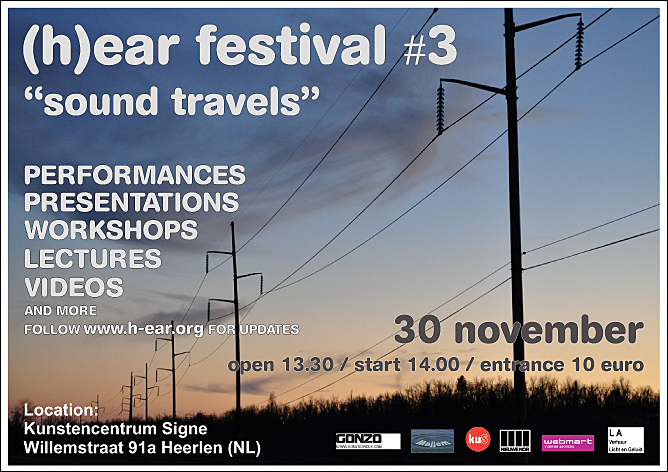 On November 30 (h)ear will present it's anual festival with the subtitle "sound travels". (h)ear festival is about Sound Art and Experimental Music with lot's of performances, workshops, installations and presentations of self-made instruments. All visitors receive a free festival CDr. It's gonna be a great party garanteed! Scroll down to see the partticipants. (h)ear festival gaat over Klankkunst en Experimentele Muziek met veel optredens, workshops, installaties en presentaties van nieuwe instrumenten. Scroll naar beneden voor de deelnemers. More names to be added! Due to the amount of cross-overs between several disciplines there will be no Lectures in particular. Some Speakers have choosen to do their talk during a presentation. Time schedule will be updated soon!